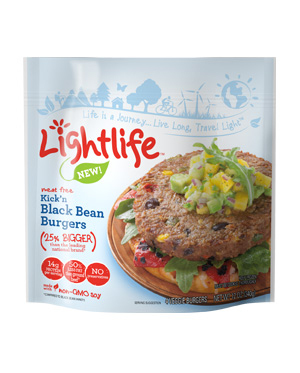 Lightlife Kickin’ Black Bean Burgers. I have recently started seeing these joints in the freezer section of Shop Rite so I figured I owed them a try. Since Lightlife has yet to let me down, I knew I was going to like what they had in store for me. These frozen patties come 4 to a bag and are vegetarian not vegan since they do have egg whites and some cheese in them. The rest of the ingredients are black beans, onions, bell peppers, barley flakes and soy protein isolate to name a few. All natural made with non-gmo soy, there are only 180 calories in each burger and 14 grams of protein as well as 6 grams of fiber. These burgers are a bit bigger then the standard veggie burger one comes across in the freezer section. 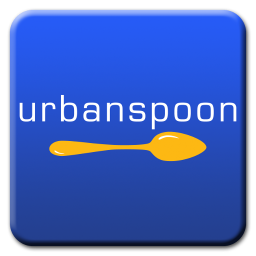 They are also of better quality and taste better, these are just an all around good addition to what is currently available in the stores. The burger itself is ‘meaty’ without tasting like meat, it definitely is filling and it holds up well to cooking. I rocked it stove top so I cannot attest to its microwave or grilling capabilities.